Charlot Salwai Tabimasmas, President of the “Rassemblement des Modérés pour le Changement” (RMC) and MP from the island of Pentecost was elected with a majority of 46 out of a total of 52 MPs on Thursday 11 February 2016. 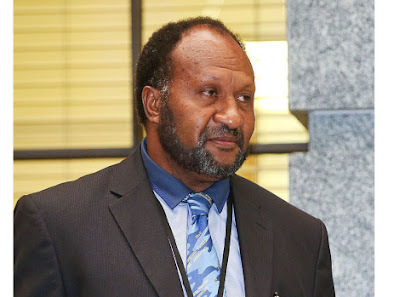 Mr Salwai is the 3rd MP from Pentecost island to occupy the position of Prime Minister of Vanuatu after the founding father of the nation, Father Walter Lini who ruled from 1980 to 1991, followed by Ham Lini. The MP from Waterfall area in Central Pentecost is also the 3rd francophone MP member to be elected to the position of Prime Minister of Vanuatu, after Maxime Carlot Korman (1991-1995) and Moana Carcasses (2013-2014). 24 hours before the Parliament sitting on Thursday February 11th 2016, reliable sources within the two main political groups known as the “Nationalists” and the “Moderates” admitted that the political negotiations and battle of numbers was very tough as each political grouping was endeavoring to secure the best deal for its political formation. Finally, the “nationalists” mostly composed of the Vanua’aku Pati and all the political fractions which were born out of VP such as the Graon mo Jastis Pati led by Ralph Regenvanu, the Melanesian Progressive Pati and several independent candidates were obliged to offer the prime minister-ship to Charlot Salwai, a “Moderate” and leader of the the RMC in order to reach a majority and form the new government of Vanuatu. With the offer made by the nationalists, Mr Salwai managed to get the support of a few other MPs and thus to put him in a position which enabled him to seal the deal with the “nationalists” once and for all. The aspirations of regrouping the Moderates during the last 2 weeks to form a new government failed, since the RMC has decided to rally with the nationalists as they were offered the Prime minister-ship. Especially with the incarceration of the leaders of the Moderates at the end of 2015, they showed during the snap elections on January 22 2015, that the Moderates still have their influence and support intact in most of the islands of the country. Unfortunately, their aspiration to unite themselves to run a government did not work out. On a different perspective, the current government coalition could be seen as a mean to bridge the gap between the “Moderates” and the “Nationalists”. Skeptical political analysts are saying that this political marriage between “Nationalists” and “Moderates” wouldn’t last very long. Minister of Health Toara Daniel Green Conf.